For 2D–to–stereo 3D conversion, our approach relies on explicit use of depth maps. Shots that contain highly textured backgrounds or that contain hair or fur can cause you problems when you’re trying to generate stereo from 2D+Depth. Transparent, blurred or out-of-focus objects pose difficulties for obtaining a true and accurate depth map for the scene. Some algorithms produce clearly visible halos that can ruin the quality of your 3D video. 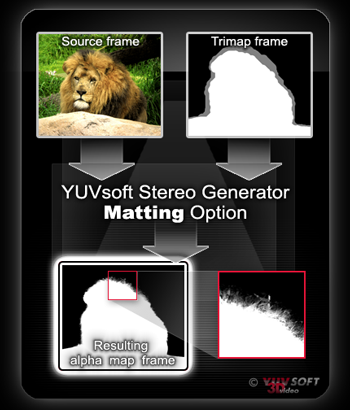 Matting is a very useful option offered by the YUVsoft Stereo Generator. This technology is a good solution when you’re dealing with scenes that contain fur, hair or motion blur. It is embedded in the image or video processing task and works together with the Background restoration tool to improve the quality of your stereo video. Blurred object boundaries usually have pixels consisting of foreground and background colors simultaneously. The main goal of the Matting algorithm is construction of accurate edges between highly textured objects in the resulting stereo. This technology also correctly handles transparent areas on the foreground-background edges. This article shows you the difference between stereo generated when the Matting option is enabled and when it is disabled. Some points on complex boundaries are a mixture of background and object color. They are marked in gray on the trimap. White indicates the foreground, and black indicates the background. The Matting algorithm decomposes gray areas in the source image into background and foreground parts. If you desire, the process can maintain the trimap to give you better results on boundary areas. The algorithm produces an alpha channel for the foreground object; this channel is used for correct color mixing of the foreground and restored background. It also helps maintain transparency on the edges of the object. The Matting algorithm removes halos from around objects while creating stereo or multiview video. This feature also correctly handles transparency, as well as the borders of complex objects. Input data for the plugin are the source, depth map and trimap videos. This is an important point: the rendered background, source depth map and alpha channel are all that you need to generate visually appealing, correct stereo. Thus the Matting technology is the part of the YUVsoft Stereo Generator plugin for semi-automatic generation of 3D content; you don’t need any other tools when you’re dealing with objects that have blurred edges or edges with fur or hair.